++ THIS IS AN UPSCALE PAINTING OF YOUR PET, WE ARE NOT DOING CARTOON PAINTINGS. This is a one of a kind, special event ++ Please read through the information regarding this event. Please Note: This is a specialized painting of YOUR pet. Only 1 pet per painting allowed. 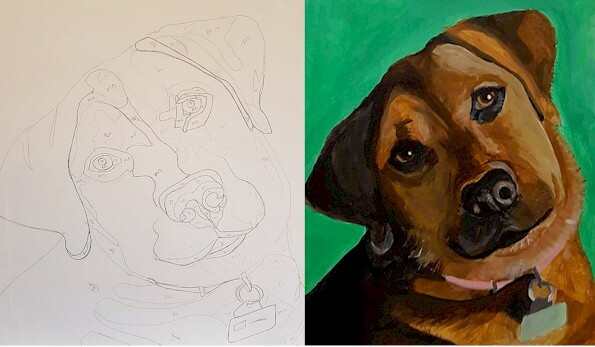 Once you have purchased your ticket please send us a VERY clear, well-lit photograph in a JPEG format via email along with your full name and order number to: [email protected] We will sketch your pet directly on your canvas for you, ready for you to paint when your arrive. It maybe be necessary for the image to be altered to fit the canvas. DEADLINE: Please note as we must allow time for our artist to sketch we ask that you mail your pet photograph within a week of signing up or no later than APRIL 2. If your photograph is not in to us by that date we will not be able to sketch your pet and you will forfeit your ticket. Event Info: Your admission includes everything needed to recreate the featured painting -- aprons, easels, paints, brushes, step-by-step instruction from local professional artist and a 16" x 20" gallery wrapped canvas to take home! We do the set up and the cleanup. No stress for you. We just ask that you arrive early so that you can select your seat. If you are in a large group the earlier the better. This will give you time to get your drinks and any food you might like.